DETROIT -- Alongside the production version of the Karma sedan at the Detroit auto show, Fisker debuted the second model to join the Karma range. The Karma S (for Sunset) concept is spawned from the same aluminum spaceframe that underpins the sedan, but loses a set of doors. A retractable hardtop covers the four-passenger interior. 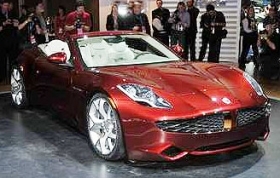 Fisker's electric Q-Drive powertrain will also propel the Karma S when it goes on sale sometime in 2011. The Q-Drive that promises a range of 50 miles on a single charge of its lithium-ion battery pack in the sedan. Company CEO Henrik Fisker also announced that Fisker Automotive plans to announce a network of roughly 40 dealers by the end of this year.